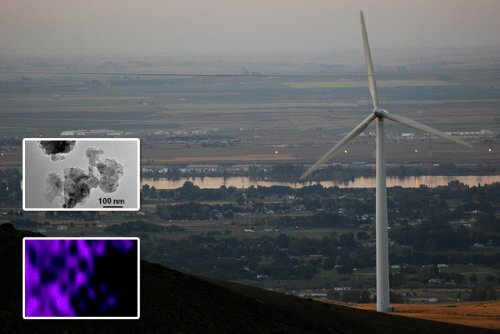 Results: Storing energy from wind farms and releasing that electricity on demand requires high-capacity, low-cost batteries; sodium-ion batteries could be part of the answer now, thanks to fundamental insights garnered by scientists at Pacific Northwest National Laboratory. Instead of force-fitting larger sodium ions into the battery electrodes built for much smaller lithium ions, the research team designed an electrode based on the ion's character, not its circumference. The new electrode or anode is built from a tin and antimony alloy, with specially designed carbon support. This durable new material can store nearly twice as much energy as a carbon electrode in the popular lithium-ion battery. Why It Matters: Balancing battery cost and capacity could be vital to implementing large-scale energy storage systems. Lithium-ion batteries, used in laptop computers and electric cars, are still too expensive. Sodium-ion batteries require less expensive materials and have been studied for some years, but the battery doesn't have enough capacity, and the anode collapses when it releases the larger sodium ions during discharge. The new alloy from PNNL could be vital to creating a durable, high-capacity anode. Methods: In a conventional rechargeable battery, the positively charged sodium or lithium ions travel between cathode and anode. During this trip, charge-balancing electrons travel through an external circuit and do work, such as fuel your electric car. The ions make the trip back and forth between cathode and anode during charge and discharge. The challenge is that while conventional anodes can accommodate the smaller lithium ions, the larger sodium ions degrade the anode, as they leave larger holes when they exit. Researchers at PNNL designed an anode where the sodium doesn't need to insert itself into the material lattice; rather it reacts and forms a chemical compound with the anode. The team designed the anode by combining, at the nanoscale, a tin and antimony alloy with carbon. The team prepared the materials using a weight ratio of 7:3, tin-antimony to carbon. "People have shown that the alloy reaction can work for lithium-ion batteries," said Dr. Jun Liu, director of the Transformational Material Science Initiative at PNNL. "But, nobody had showed that similar reactions could work for sodium. Our paper is the first to show that you can use the alloy reaction to store sodium ions in the anode." Based on transmission electron microscopy work at EMSL and other examinations, the team believes the tin- and antimony-rich phases that likely formed during the battery's operations support one another. When one phase becomes disconnected, the other phase takes up the slack, remaining stable and continuing to interact with the sodium. "In sodium ion batteries, challenges exist in reversibly inserting and extracting those fat and heavy sodium ions in the electrode materials without destroying the host structures," said Dr. Jie Xiao, a senior scientist at PNNL with extensive experiences on energy storage technologies. "Use of SnSb/C nanocomposite smartly avoids this situation by taking advantages of the alloying reactions between sodium and metallic elements." In tests, the team found that the anode has a reversible capacity of more than 500 mAh/g, that's the amount of charge held per gram of the anode. The anode was able to quickly charge and discharge without significant loses in capacity. The theoretical capacity of graphite used for lithium-ion batteries is 372 mAh/g. What's Next? The team is optimizing the alloy composition and structure and carefully examining the structural change of the different alloy phases during the reactions. Further improvements on the alloy could lead to higher capacities, increased durability, and faster charge/discharge cycles and eventually result in wind farms heating houses and powering appliances when breeze-free days. Research Team: Lifen Xiao, Yuliang Cao, Jie Xiao, Wei Wang, Libor Kovarik, Zimin Nie and Jun Liu, Pacific Northwest National Laboratory; Lifen Xiao is also affiliated with Central China Normal University; and Yuliang Cao is also affiliated with Wuhan University. Reference: L Xiao, Y Cao, J Xiao, W Wang, L Kovarik, Z Nie, and J Liu. 2012. "High Capacity, Reversible Alloying Reactions in SnSb/C Nanocomposites for Na-Ion Battery Applications." Chemical Communications 48(27):3321-3323. DOI:10.1039/C2CC17129E.